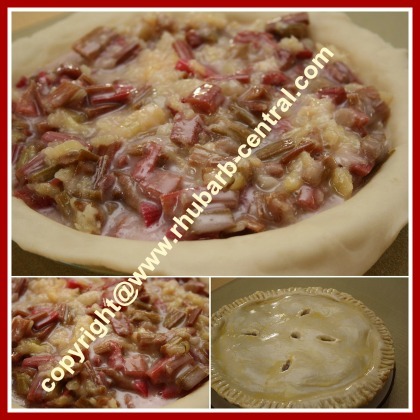 This Rhubarb Pineapple Pie Recipe is a quick and easy recipe for a citrus rhubarb pie using fresh or frozen chopped rhubarb. The natural tart flavour of the rhubarb combines well with the pineapple to make a fabulous flavourful rhubarb pastry pie! 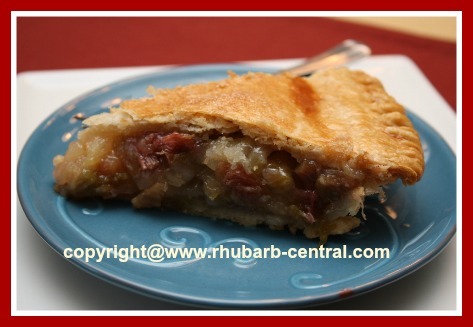 A Scrumptious Homemade Pineapple Rhubarb Pie! I just made this DELICIOUS pie today, and it turned out WONDERFUL! Check out the pictures; this pie is a winner for sure! 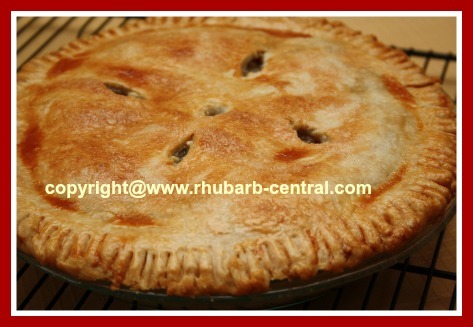 It never ceases to amaze me how many different types of fruit you can pare with rhubarb to make an amazing pie! Note - If you are using frozen rhubarb for this recipe, thaw the rhubarb in a sieve over a bowl (the evening before), and discard the excess liquid. You may need to thaw slightly more than 3 cups of frozen rhubarb to make the 3 cups of thawed rhubarb. This Rhubarb Pie is Oven-ready! 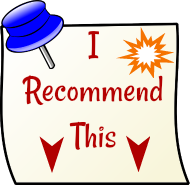 ﻿In a large bowl, combine the all-purpose flour and the 1 1/4 cup granulated sugar using a fork or a whisk. Add the prepared rhubarb and the crushed pineapple to the sugar/flour mixture. Roll pastry and line a 9" pie baking dish. Roll the top crust, and set aside. Transfer the rhubarb and pineapple pie filling mixture into the pie shell. Moisten the edges of the pie with the beaten egg. Cover with the top pastry crust. Cut slits/vents out of the top pastry crust. Brush the entire top pastry crust with the beaten egg white. 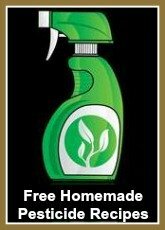 (This helps to seal the fruit and fruit juices in the pie). Sprinkle the top of the unbaked pie with the remaining 1/2 tsp. of granulated sugar. Bake on bottom shelf of the oven at 350° F for about 60 - 65 minutes, or until the fruit juices begin to bubble out of the vents. If you have a handy pie crust shield (which I heartily recommend), place it over the pie after the pie has baked for approximately 40 minutes to help prevent the pie crust edges from becoming too dark. So Yummy! Enjoy every bite! 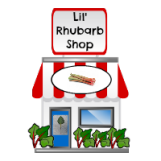 Did you know that rhubarb is a fruit not a vegetable? Although often used as a fruit and baked into muffins, crumbles, crisps, etc., rhubarb is classified as a vegetable. 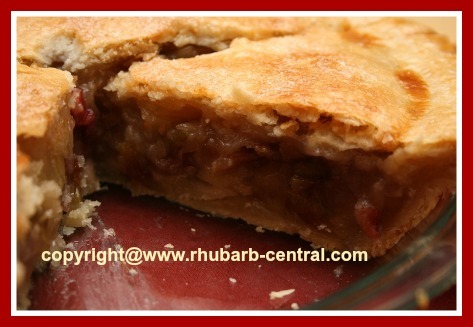 Another name for "rhubarb" is "the pie plant". No wonder rhubarb and pies seem to be synonomous!